Seeing Tahrir (Liberation) Square empty as the country sits on the brink of a historic turning point feels eery. Thursday's inflamatory comments about the Supreme Courts rulings had raised fears that everything could go wrong just moments before the second and final round of what has been dubbed Egypt's first ever free and democratic presidential elections. Instead, Egyptians have deserted the streets. The Muslim Brotherhood is upset at the decision to dissolve the parliament in which they held a majority of seats but why isn't it calling for its troops to take back to the streets? Is it because Mohamed Morsi thinks he can win this weekend's election? At a small mosque in a lower class suburb of Cairo the candidate looks confident as he kneels in the very first of the tens of rows of faithfuls who have come to pray by his side. Morsi won't talk to us because he can no longer address the press. Instead, he turns to his supporters and lets them do the talking: "May God grant you victory...you are our Messiah". Morsi smiles, accepts kisses on his forehead and waves to those in the distance. He has warned that if there is foul play over the weekend, he will take his troops back to the streets and threatens to ignite Egypt's second revolution. 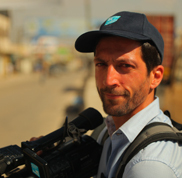 Gallagher Fenwick is FRANCE 24's Middle East Correspondent. He has reported from Egypt extensively during the transition from Hosni Mubarak's rule to a burgeoning multiparty democracy.